You may have noticed that I have not commented on "future firmware updates." Not from Fujifilm, not from Nikon, not from Olympus, not from Panasonic, and not from Sony, all of which have put out press releases or held conferences on future firmware. I have a policy on sansmirror that's a little complex to describe, but I think realistic: I don't tend to write or comment about future details. For instance, in the press backgrounders Canon has been doing for the just-announced RP camera, Canon has acknowledged that they will do sensor-based stabilization with some future body(s). That's a detail without detail ;~). There's no useful way to speculate about it, as not only do we not know when that will happen, but we don't know exactly how it will be done, and how many bodies it might appear in, let alone what the performance change it might make. Much of the "future announcement" stuff I see, including firmware updates, is FUD marketing (Fear, Uncertainty, and Doubt). That's a technique used to put people off from pulling the lever and buying a competitive product now against what might be dangling in the future. I strongly advocate against FUD marketing for one reason: it's an acknowledgment of deficit. Thus, Canon's "future IBIS" confirmation is actually an admission that the current R and RP are not competitive in some aspect (sensor stabilization with all lenses). Only the truly naive will miss that. Meanwhile, much of the other "future announcements" I see are what I'd call "We'll fix that." The firmware updates often tend to have examples of that in them. A feature was left off at shipment because it wasn't ready, or performance will be enhanced because they didn't have time to actually fully test and optimize in their tight release scheduled. Nikon's upcoming firmware for the Z series has components of both FUD and Fixing. The 12-bit raw video to external devices is FUD, the Eye Detect and focus improvements are Fixing. So why do I not tend to write about these things again? Well, FUD is just marketing and positioning, and there's no way for me to validate whether the future bit being FUDed will actually have any real impact. By the time the item arrives, there may be other and better examples of it on the market. And Fixing requires testing to see if the fix actually works and was desirable (and without side effect). Again, tough to write anything useful about those things when you don't have it to test. Now, I will from time to time speculate about future cameras or lens lineups overall (as opposed to in detail). I believe there's benefit to be gained from analyzing companies' strategies and positioning, and to do so you have to look forward as well as backward. Camera development announcements—such as Panasonic's full frame S1/S1R teased at Photokina—also give us something reasonably tangible upon which to base such speculation. But individual features, particularly firmware updates that might or might impact performance dramatically? Not so much. So I'll continue to stay silent on these "future" press releases and press briefings about details and instead wait until the item being pre-announced or teased before writing about them. Time to ding Nikon again. Back at the NAB Convention in April 2018 I specifically asked (and wrote about) CFExpress upgrades to the XQD DSLRs. Nikon's response was that "they'd need word from Japan about that" and that they'd see if they could get it and get back to me. 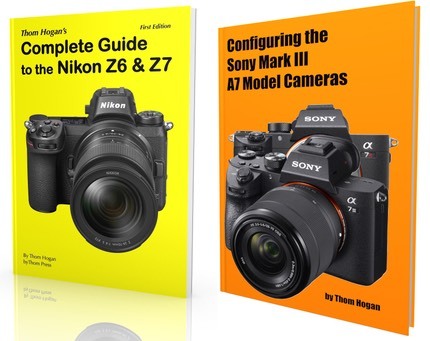 Well, Japan finally announced that there will be, but NikonUSA—all three people who promised to follow up with me—did not follow up, if only to point out the press release that indicated it was coming. I learned about this the same way you did, despite having asked NikonUSA multiple times through multiple channels. Of course, these firmware updates are in the future, so there's really nothing much to write about, is there?